What do I need to do before I start my lessons? Before you start to drive on a public road or take your theory test, you will need a valid Provisional Driving Licence. You can obtain The Driver and Vehicle Licensing Agency (DVLA) application form (Form D1) from your local Post Office or also online. We cover the Exeter area, within Devon and Mid Devon outskirts and also the surrounding towns of Crediton, Tiverton, Ottery St Mary, Honiton, Exmouth and Cranbrook to name a few. We roughly cover a radius of 10-15 mile radius from Exeter. If you are outside these areas you may incur extra mileage cost. Check out our latest pricing & offers. Can you pick me up from home/school/college/work? Yes we can pick you up from anywhere you like within our 10 mile radius from the centre of Exeter. If you are outside this area you may incur extra mileage cost. How many lessons will I need to be able to pass my test? This varies for each individual but we ensure your personalised learning plan is tailored exactly to meet your learning style, encompassing a structured sylabus with ‘goal’ setting so we can continually monitor and evaluate your progress and ensure that you will be a confident and safe driver ready for your test and road to success. I have a lesson booked but need to cancel it - will I get charged? If you can’t make your driving lesson and you let us know at least 2 working days before the lesson date you will not be charged. Any late cancellations where we do not receive at least 2 working days notice will incur your lesson fee. Where is my local test centre? Driving tests are conducted from our local driving test centre by a DSA examiner and last for about 40-45 minutes. Most of the test routes involve town driving and if possible, single and dual carriageway roads outside 30 mph limits. Do I have to do the theory test first? You may be already having driving lessons or even ready to take your practical test but you can not apply for your practical test until you have passed the Theory Test. The theory test is made up of two parts; a multiple choice questionnaire and a hazard perception video test and you will need to pass both to get your certificate. 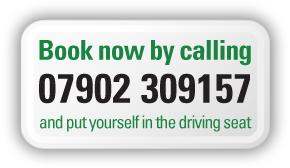 If you feel you are ready to book your theory test you can book it online using the button below. The theory test must be passed before you take your practical driving test. The theory test consist of a multiple choice test, and a hazard perception test. Find out more about the theory test. Once you have passed your theory test you can then (on advice and guidance from your instructor) take the practical test. The practical test consist of an independent driving section, show me tell me section and the actual driving test. Find out more about the practical test and if you are ready. What is the eye sight distance in your driving test? At the start of your practical driving test you have an eyesight test. You’ll have to correctly read a number plate on a parked vehicle. If you can’t pass the eyesight test you’ll fail your driving test and the test won’t continue. DVLA will be told and your licence will be revoked. When you reapply for your driving licence, DVLA will ask you to have an eyesight test with the Driving Standards Agency (DSA). This will be at a driving test centre. If you’re successful, you’ll still have to pass the DSA standard eyesight test at your next practical driving test. Can I get cheaper car insurance if I do the Pass Plus course? Statistics show that new drivers are more likely to have an accident in the first two years after passing their test due to lack of experience. Pass Plus builds on your skills and knowledge. It will teach you how to anticipate, plan for and deal with all kinds of hazards, to help you become a more confident driver and you may be able to claim discount off your first year’s car insurance with some insurance companies.